The Sin Bin Sports Blog: Can Quick Get A Fourth Straight Bagel? Can Quick Get A Fourth Straight Bagel? Over Jonathan Quick's last three starts, he has stopped all 83 shots he has faced and has set a Kings franchise record with three consecutive goose eggs (please excuse some of the hockey jargon, I am a fan of Quick and the Kings and I don't want to go jinxing them by saying that dreaded word before the game). In Quick's last appearance, he turned away all 28 shots thrown his way in a 1-0 win over the Dallas Stars. 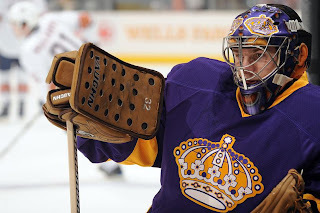 Quick got a game off when the Kings faced the New Jersey Devils on Tuesday, but will be in net tonight when the Kings and Stars face off for the second time in five days. Coming into the game Quick boasts a gaudy .81 goals-against average and a .972 save percentage on the season. Considering Quick's success against Dallas in the past, Quick should have a good chance of extending his streak. Quick is 11-3-0, 5-0 in his last five starts, and has a 1.91 goals-against average against Dallas. Recent success could point out that even if Quick does not carry his team to another flawless victory, the chances of his carrying his team to at least a win should be high. But if Quick goes another 60 minutes refusing to give up a goal, and adds to his already lead leaguing totals, Quick will have asserted himself as the leagues hottest goaltender.